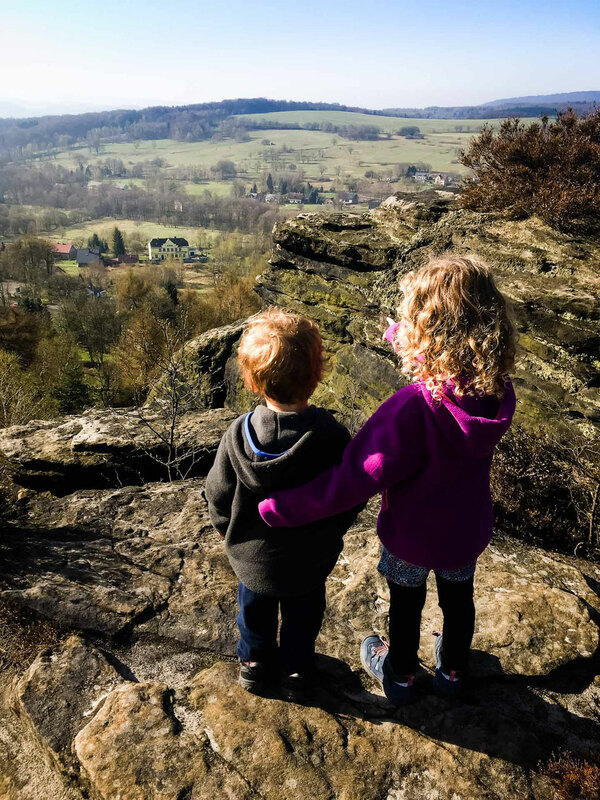 We love hiking and sharing our appreciation of nature with our kids. 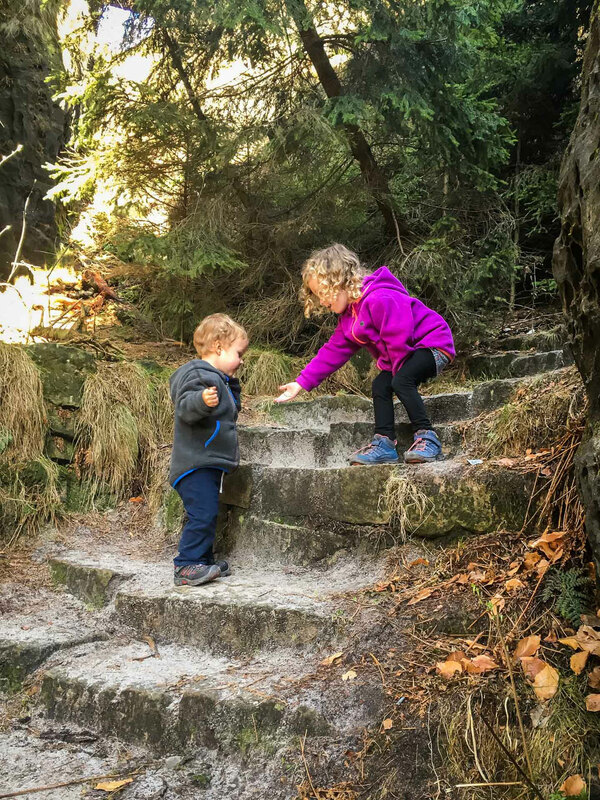 At 2 & 4 years old respectively, they are at a tricky age – they are old enough to walk reasonable distances, but they are not able to do any epic mountain trails yet. 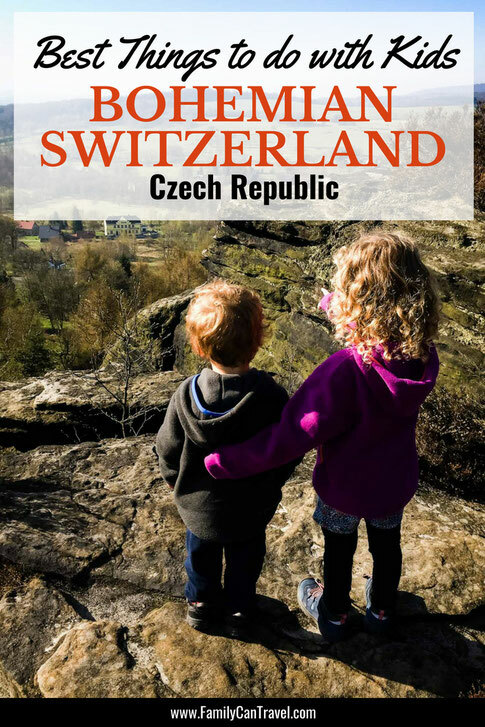 We were so excited when we discovered Bohemian Switzerland National Park (České Švýcarsko), the Czech Republic’s newest national park. 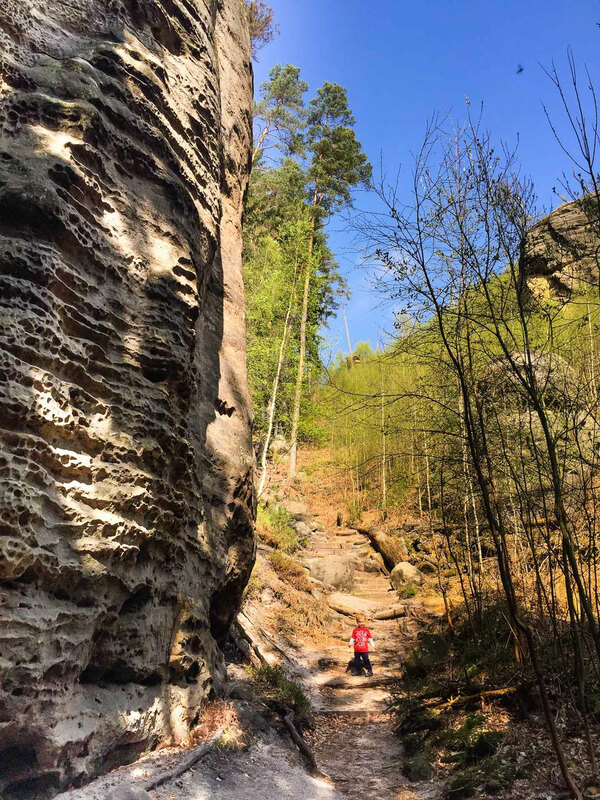 It’s technically part of the Elbe Sandstone Mountains, but Bohemian Switzerland is mostly hills compared to the nearby peaks of the European Alps. 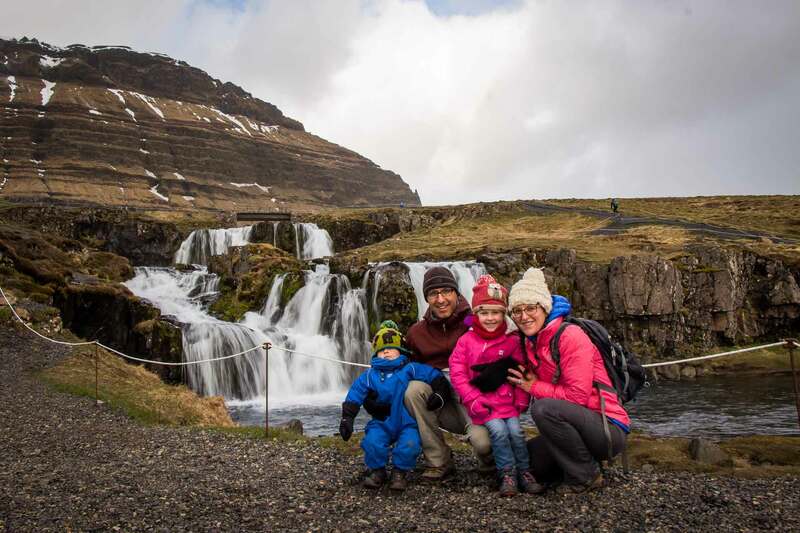 It has tons of hiking, ranging from short family friendly hikes, to the more challenging, yet very rewarding Wild Gorge loop. After settling into our Airbnb in Bynovec, we drove to Jetrichovice for a short afternoon hike. 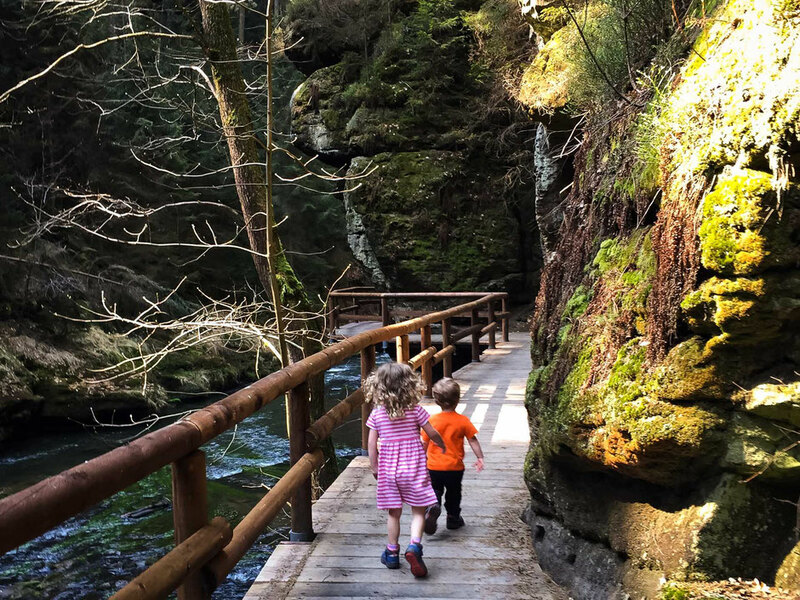 The Bohemian Switzerland National Park boundary begins just north of town and there is a beautiful, medium effort hike up to a couple of viewpoints. The return trip is approximately 3 miles (5km) in total. There is a free parking lot near the trailhead. From here, the trail starts as a flat, paved path, but soon transitions to a dirt & sand mixture as your enter a beautiful valley. 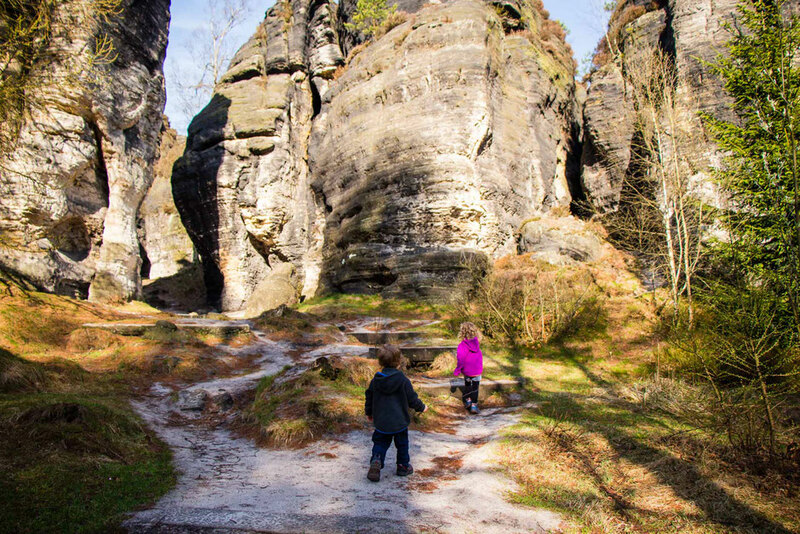 The hiking path is surrounded on both sides by dense forest, with towering sandstone stones and cliffs mixed in for an amazing effect. 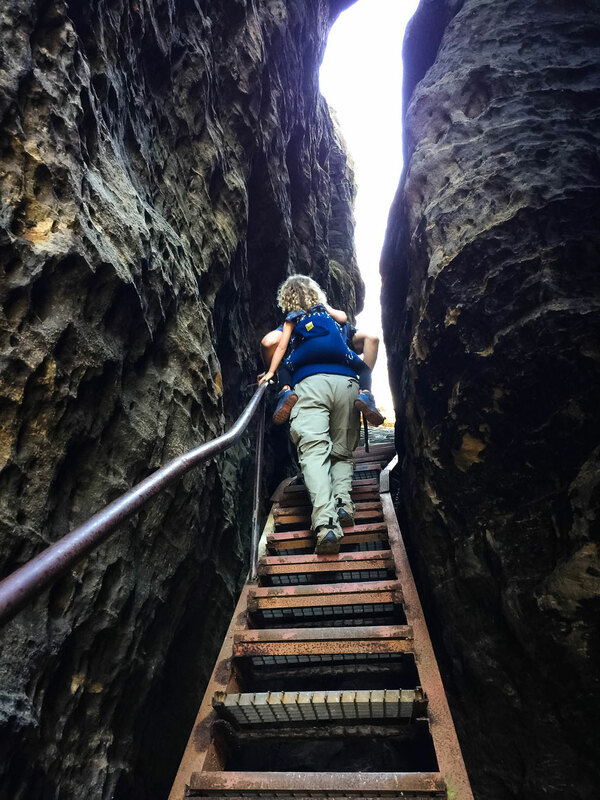 The hike climbs steadily upward, with most of it being stairs made from cut logs or simply cut out of the sandstone itself. After 0.7 miles (1.2km), you arrive at the junction which takes you the Mariina Vyhlidka (Mary Prospect) lookout. The stairs up to the lookout go for 0.3 miles (0.5 km) and are very steep. 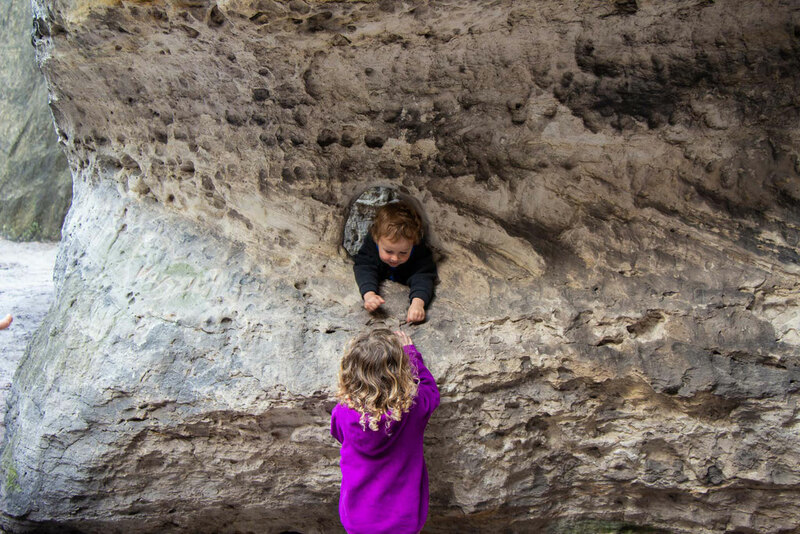 We held our kids pretty close for safety reasons. The views from the lookout are stunning. 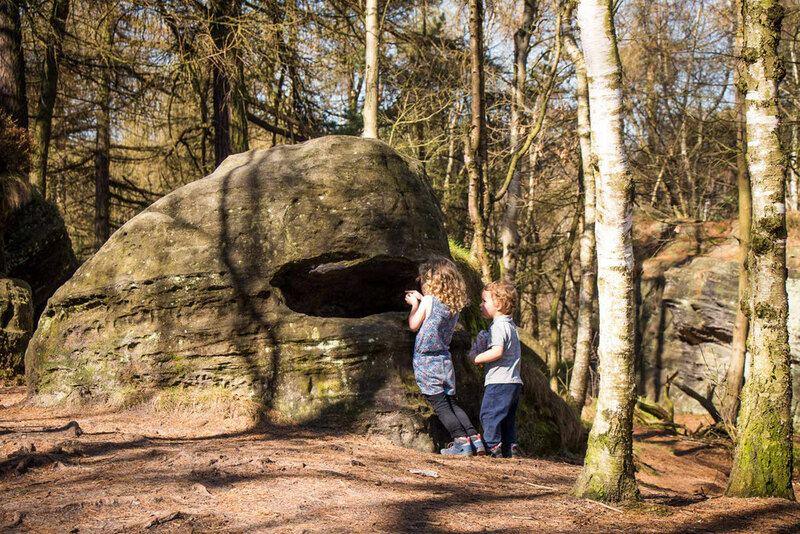 You will be rewarded with views of the surrounding hills & the forest, sandstone slabs of rock emerging from the forest canopy, the nearby towns and surrounding farmland – so worth the effort! Despite the hike to this point being mostly up stairs, it wasn’t really that hard for the first section up to the stairs. 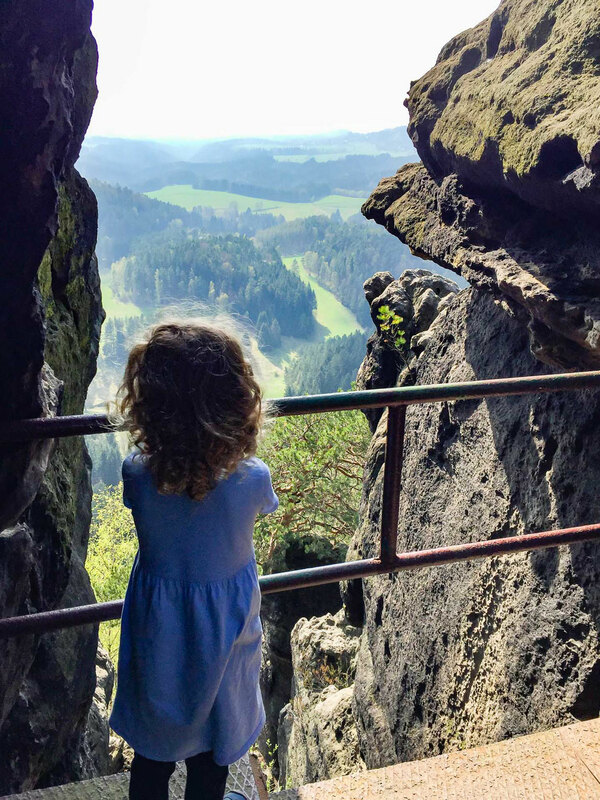 Our 4.5 year old daughter hiked up the whole way to the lookout, with only a little help when the stairs were too high or we felt it was a little too dangerous. 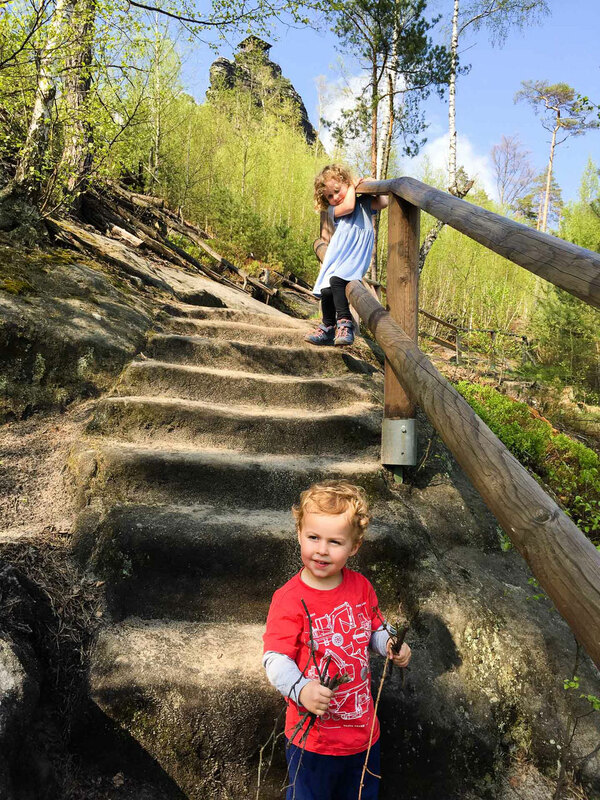 Even our little guy (2.5 years old) hiked all the way to the top, with a little more help as many of the steps were too tall for him. We put out kids in their carriers for the walk back down the stairs as they were way too long and steep for them. The walk to Vileminina Vyhildka (Wilhelmine’s View) is much easier. The walk is around 0.5 miles (0.8km) and is mostly flat, with a transition to uphill towards the end. The views from this lookout were equally amazing, with a good view of the first lookout, which is always kind of fun. The next morning, we drove 35 minutes to the town of Tisa to hike around the Tisa Walls. The Tisa Walls are a series of rock outcrops which tower dramatically above the town. These rock formations are especially fun to explore as 75 of them have been identified as looking like things (faces, turtles, decapitated mayor’s, etc), so you will spend the whole time looking around and using your imagination. You can buy a map from the entry booths for 10kr which tells you what each of the 75 formations look like. Each one has a number associated with it and is painted on the rock. This is a super fun place for kids to run around and explore. The sandstone rocks tower overhead and there are all kinds of rocks to climb or hide behind, fissures in the rocks to explore, holes to poke your head out of, stairs to climb, lookouts to enjoy, etc. Our kids were having so much fun that they ran around ran around like little maniacs for at least the first two hours! There are two entrances to the Tisa Walls – one outside of town by a restaurant and one in town by the cemetery. We recommend starting at the cemetery entrance as it allows you to easily walk both loops. We walked the Male Tiske Steny loop first. This loop is the shorter one of the two, but is more fun for kids as there are very few fences to keep them from exploring the rocks. Our kids loved this loop and they had the time of their lives running in and around the rocks, exploring and playing games. This loop includes a few climbs up stairs to viewpoints at the top of the outcrops. The views are beautiful of course, but I admit to being a little nervous with the kids up so high with no guard rails. 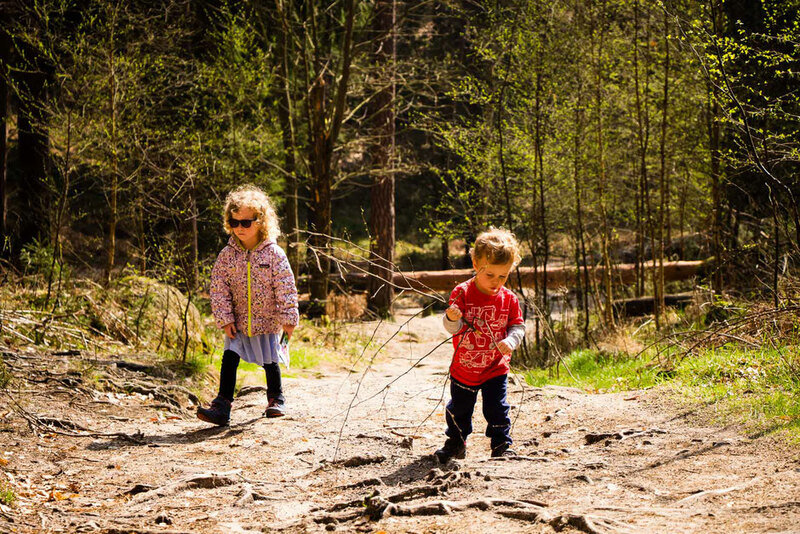 The Velke Tiske Steny loop is longer and less fun for the kids than the first. This loop has more guard rails to keep people on the path and away from the rocks. This, coupled with the fact that we needed to hurry things along for nap time, meant the kids couldn’t play as much in the rocks. This loop featured a few segments where you stray from the rocks and walk through a beautiful forest, but these segments don’t take long. Shortly after we passed the famous turtle and mushroom formation, we found ourselves by the restaurant near the other park entrance. It turns out that we missed the trail which loops back to our entrance. The nice lady working the booth did a good job explaining where to go, despite her lack of English. 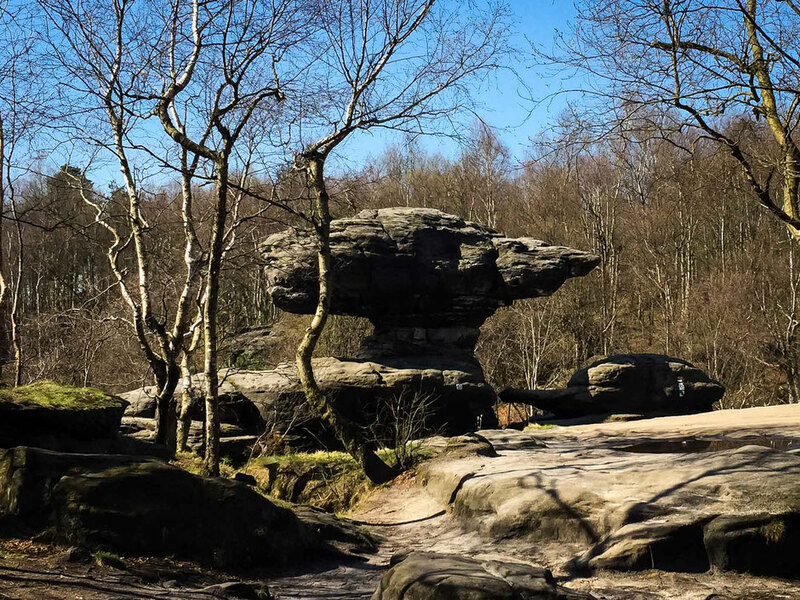 The last leg of this loop walks along the top of the rocks, giving sweeping views of the town and land beyond. Today was an epic day! 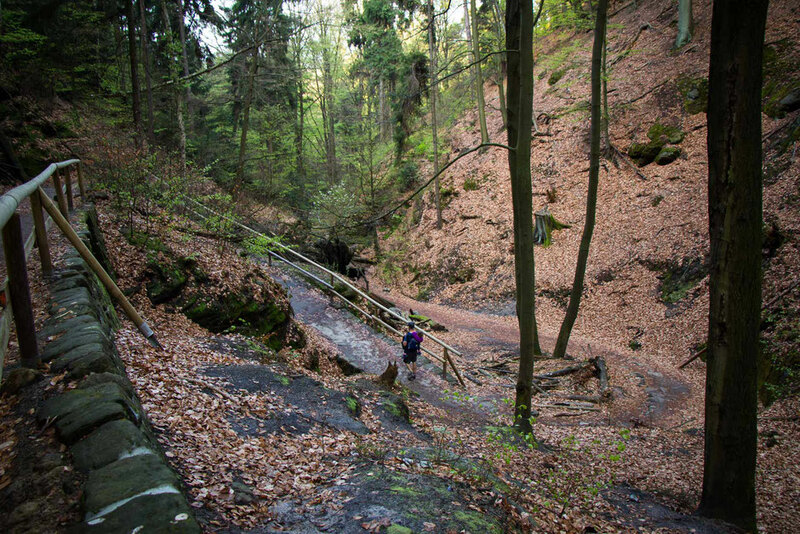 Our main activity for the day was to hike the loop from Pravcicka Brana to Menzi Louka to the Edmond and Wild Gorges to Hrensko. This amazing hike, including the two short boat rides in the gorges, spans 12.5 miles (20km) and took us just over 6 hours. There are so many natural wonders to see on this hike. Pravcicka Brana is the largest natural stone bridge in Europe. The trail to the arch is reasonably steep uphill, but afterwards, it is either flat or dowhill. 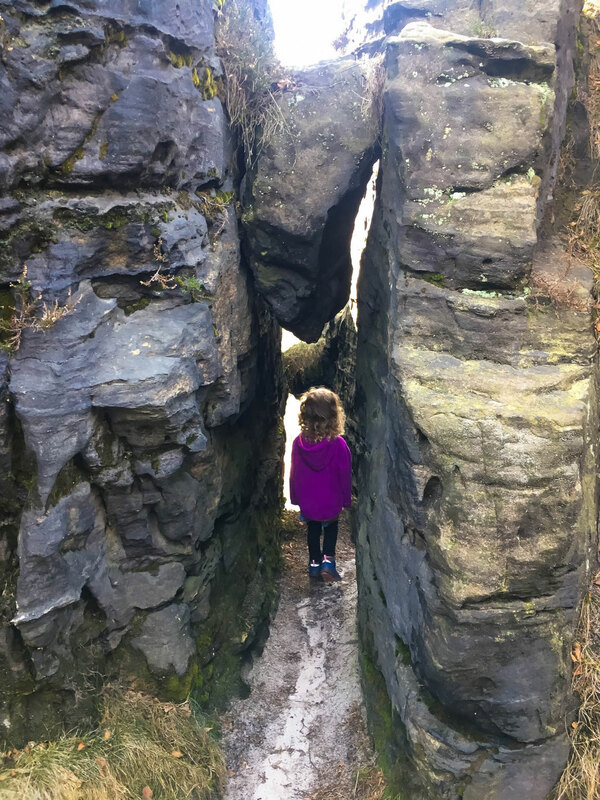 After the arch, you start Gabriella’s Path; an exceptionally beautiful hike with towering sandstone cliffs on one side and panoramic views on the other. After Gabriella’s Path, you descend down the mountain through Menzi Louka and enter the gorge where the hike becomes a lot of fun. The path follows the river and alternates between being on land and on elevated wooden pathways over-top the river. The scenery here is insanely beautiful and it really is a special hike. At two stages of this hike, the trail ends and you must board a boat, powered by guides using long poles (think gondoliers in Venice…). This hike was obviously too long for our kids to walk themselves, so we had them in their carriers for decent amounts of the outing. 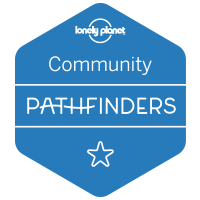 We also leaned heavily on our Terra Map Pro hiking app to find the right trails throughout the day. 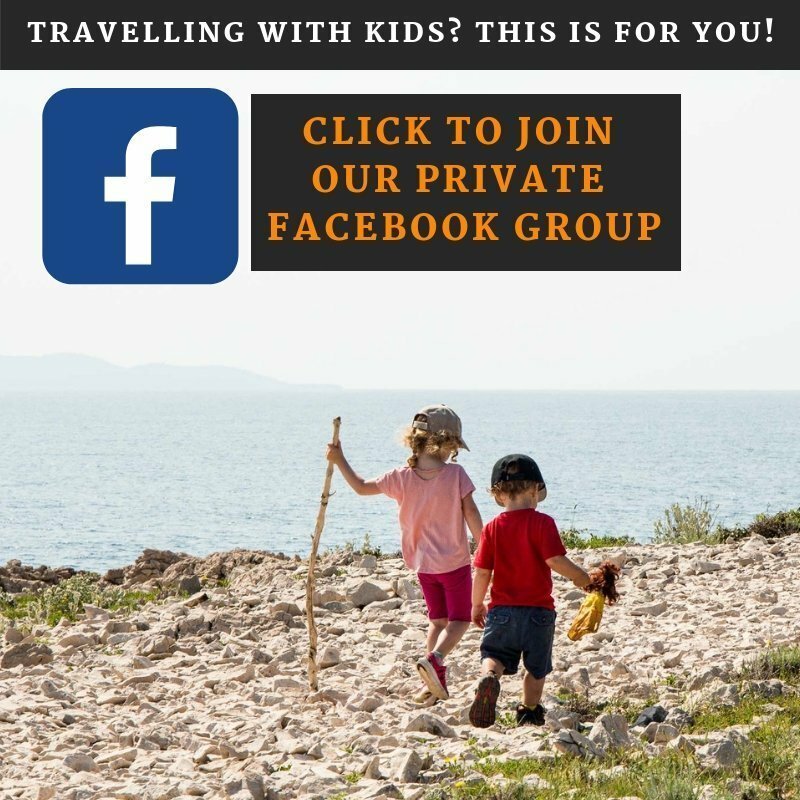 For more details about this hike, visit our Hiking the Pravcicka Brana to the Wild Gorge Loop blog post. 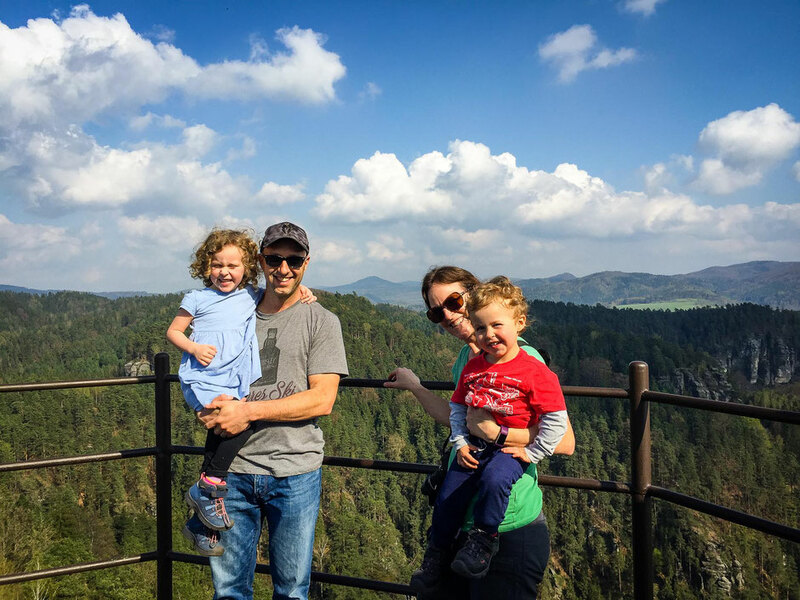 After the Pravcicka Brana hike, we hopped in the car and drove 35 minutes north, to Rathen, Germany to hike to the Bastei Bridge. 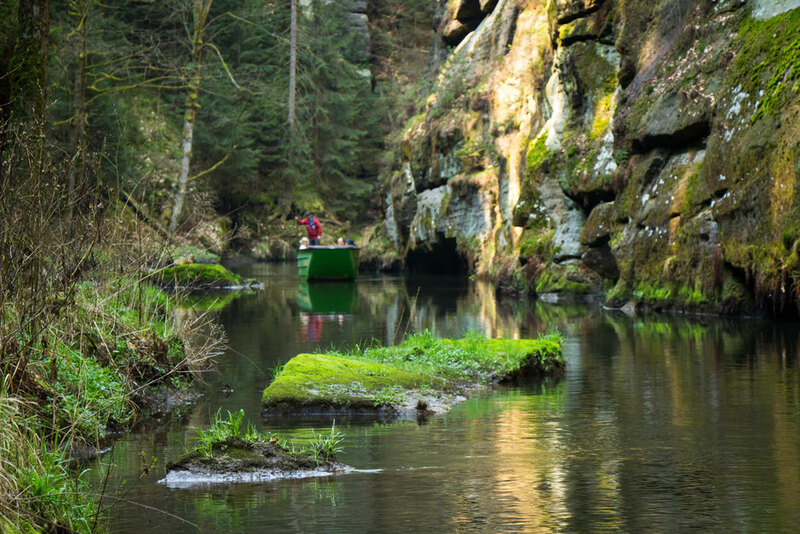 This area is part of the Saxon Switzerland National Park, the companion park to the Czech park Bohemian Switzerland. 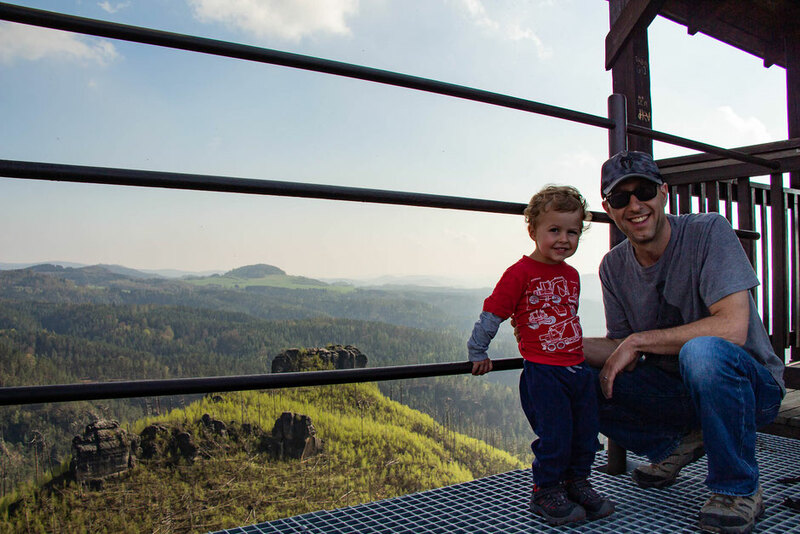 After parking in Rathen, we put the kids back in their carriers and began the 1 mile uphill hike to the Bastei Bridge. 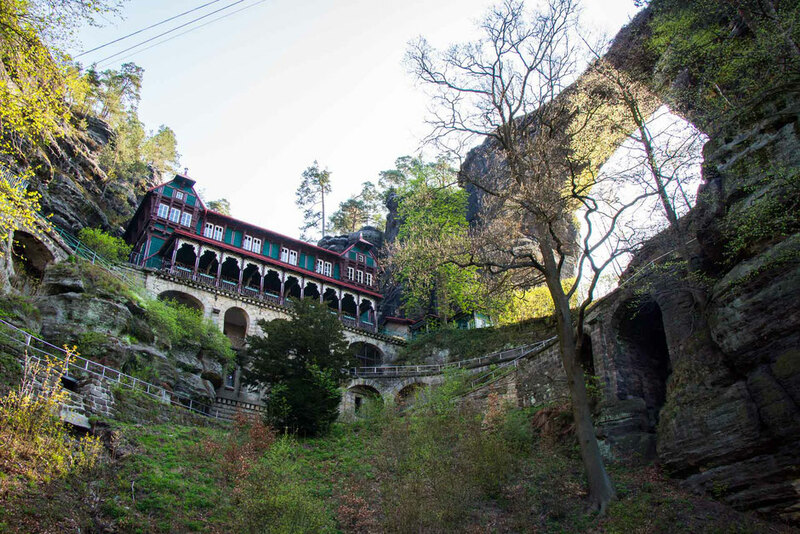 Being so close to the Bohemian Switzerland, it’s no surprise that the scenery here is equally amazing. 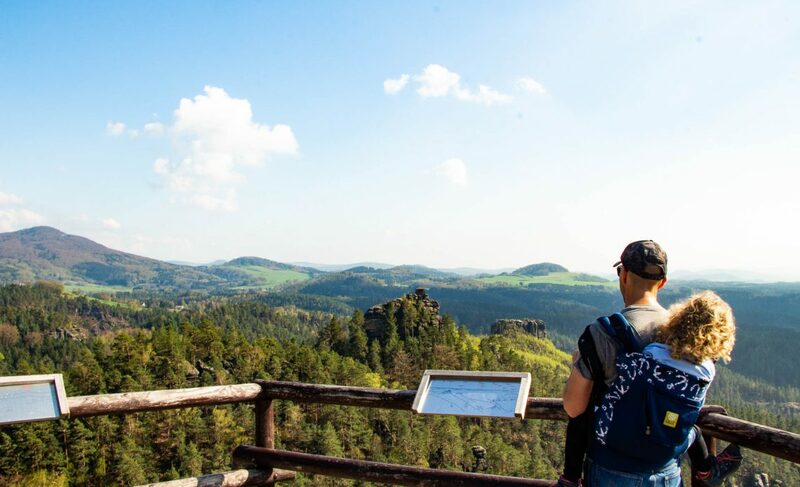 A few points along the way, there are lookouts where you can enjoy sweeping views of the Elbe River below. Bastei is a famous rock formation in Germany. 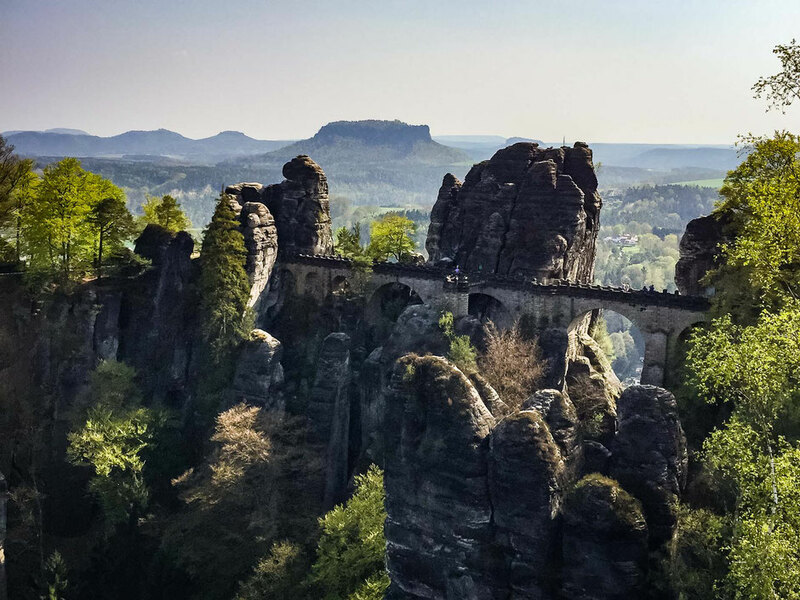 The aptly named Bastei Bridge is a 250 foot (76m) long bridge which spans the tops of several of these towering rocks. The walk across the bridge is short, but offers many spectacular views of the surrounding rock formations. Past the bridge there are two pathways which lead to alternate viewpoints, offering amazing views of the bridge itself and the rock formations. 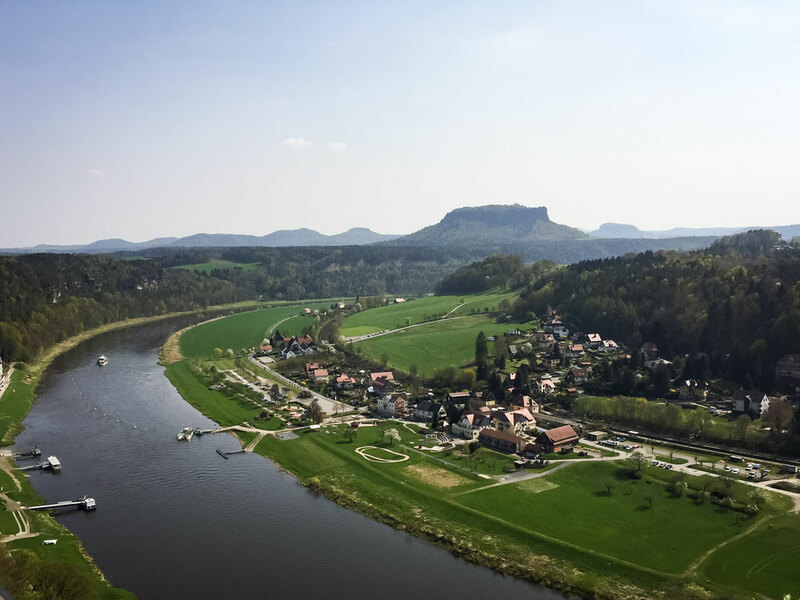 Hrensko: Located on the western edge of the park on a river which shares a border with Germany, Hrensko is a convenient place to stay for adventures in the park. 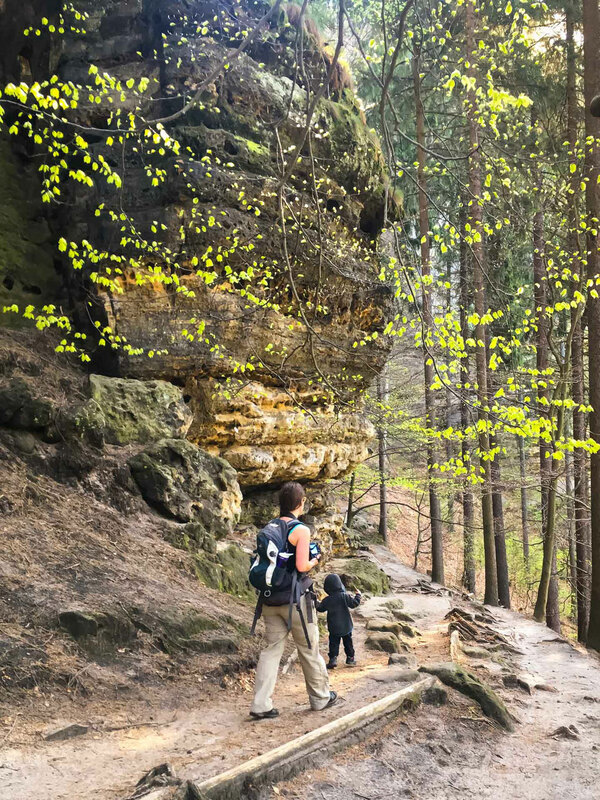 Hikes to the famous sandstone archway Prebischtor Gate (Pravcicka Brana) start from here. There are a decent amount of restaurants and shopping here as well. Jerichovice: Tucked in the SE corner of park, Jerichovice is another good choice for a place to stay. 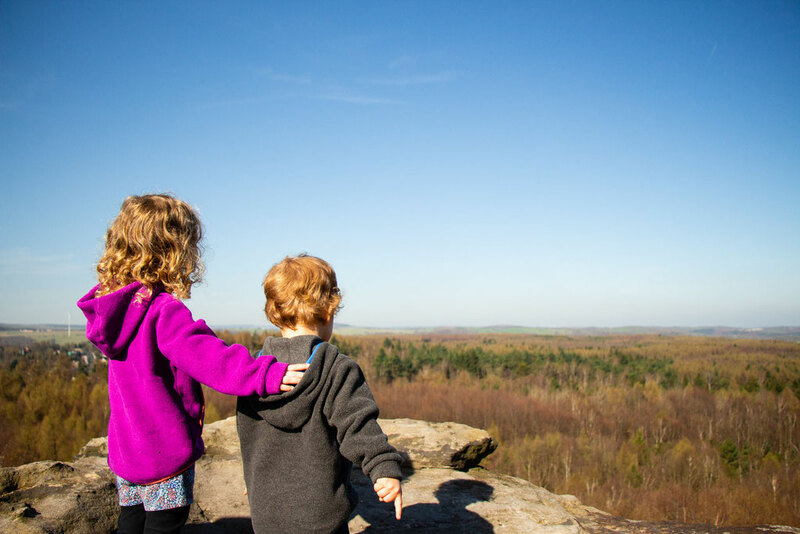 A modest sized town with amenities, this is the starting point to several top park attractions, including the Mary Prospect Lookout (Mariina Vyhlidka). Bynovec: This is where we stayed in an Airbnb apartment. This town is tiny and has nothing in it, but is conveniently located in the middle of Hrensko and Jerichovice. Any of the small towns in-between Hrensko and Jerichoivice will do just fine as well. The roads are windy and tight, so being located in the middle reduces the amount of risky driving you will do while here. Decin: With a population of nearly 50,000, Decin is the nearest major center to the park. It’s further to drive to park attractions, but it comes with its own attractions and all the benefits of being in a city – restaurants, grocery stores, banks, etc. How to get from Prague to Decin. If you want to do some hiking in the region, you’ll need a rental car.